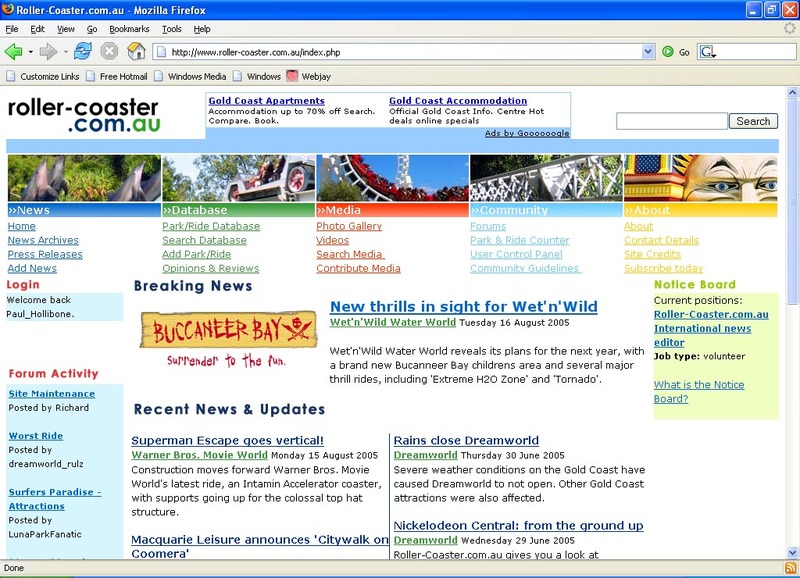 The Roller-Coaster.com.au forums will be going down for maintenance at approximately 11:30pm tonight. I anticipate they will be running once again at 12:00am or there abouts. The main site will continue functioning as usual. I may be crazy, but are there meant to be any new user interface changes or something? Obviously as you can see the site is back up and running. You'll also notice that we have changed forum software, from vBulletin to Invision Power Board. Both vBulletin and Invision are top quality products. Ultimately it was a choice between upgrading to the latest version of vBulletin for USD$30.00, or changing to Invision for USD$70.00. Both are competing products with very similar features. Ultimately what it came down to was what future versions of each hold. I chose Invision based on a myriad of new features to be launched which I think will be of great benefit to this community. I think also Invision Power Board is a better looking programme, and the management side of things is a vast improvement on vBulletin. The site will be customised to fit in with the main site's design in coming days. It will take some getting used to for all, including myself. I welcome any comments or suggestions regarding this new change. I like the new forums design, much nicer then before. personally, I like the old version on Vbulletin, however since Richard is still ironing out creases and changing the styles etc, I'll reserve judgement. I do certainly hope the changes will see the return of the "quick reply" area, as going to a new page to create a post has its problems, I also hope that the "please wait while we direct you" message will not be hanging around long, and basically that the forums features we have had to this point won't be lost in a compromise for "better" features. I have added the quick-reply box and removed the redirect message. As you said, I'm still working through a lot of things with the new forums. Most of the initial effort has gone into ensuring that the user system works correctly to allow the features of the main site to work. A note to everyone that the user features on the main site are now functional again. This includes Park/Ride Counts, Opinions/Reviews and the Video section. Looks good except ads are still displayed thoughout the site when I'm logged in. The ads are starting to annoy me... I'm subscribed, logged in, yet they continue to chew threw my bandwidth on every forum load... If would be great if you could get it sorted. The forums are now fixed. They will be fixed shortly on the main site. Hey Richard, Have you got any way of updating the timestamps to Aus EST? All my times - and I think everyone else's - are of some weird time zone. Any way you cna change it or do I have to do it in my personal prefs? Nev – Go into my controls at the top of the page, then under options, go to board settings, and set the time to 10hours+ and that should set the board time right for you. Ads are now removed for all subscribers site-wide. I'd like to thank all subscribers for their patience during this transition period. There are nicer ways of saying that you know. That said, it seems fine to me still. Are other subscribers seeing ads? Paul... how is Richard going to correct the problem unless you tell him where the ads are? Most of the ads are gone for me except I can still see ads on the database page. I could have sworn I added an Attachment. I can't see any reason that there would be ads displaying on either the index page or the database page. Is this still the case? Well the ads are gone all in those area's now. Wern't Before. Fixed for me too. Thanks.